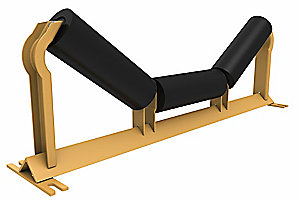 Exalon mx style conveyor rolls available at Innoveyor Inc.; Innoveyor manufactures an Exalon mx style HDPE (High Density Polyethylene) conveyor roll, quality, three year warranty, retrofit all makes, models of frames, Continental, Goodman, FMC, etc. Exalon mx style conveyor rolls available in CEMA C, D, E and F, with special built-to-order retrofit rolls for your nonstandard idler needs. Reduced belt damage; The smooth HDPE surface of the Exalon mx roll minimizes belt friction and wear, acting as a slider bar in the event the roll stops turning, all composite construction no steel edges, no “pizza cutter”, belt run longer – production increase. Innoveyor understands standard idlers do not meet all conveyor belt needs, Innoveyor offers custom design frames and Exalon mx style rolls for your non-standard, special applications. We”ll do our best to get back to you as soon as possible.